*NYC fireman Patrice McLeod, the only African American in the New York firehouse visited by President Obama last week in the wake of Osama bin Laden’s death, was banned from meeting the Commander in Chief because he was not on duty that day. According to the New York Times, the Secret Service told him he would not be on the list of people to be vetted so he should not come in. Intent on meeting the president anyway, McLeod ignored their instructions and waited outside his Engine 54/Ladder 4/Battalion 9 firehouse. Unfortunately, McLeod was still unable to meet the president directly. 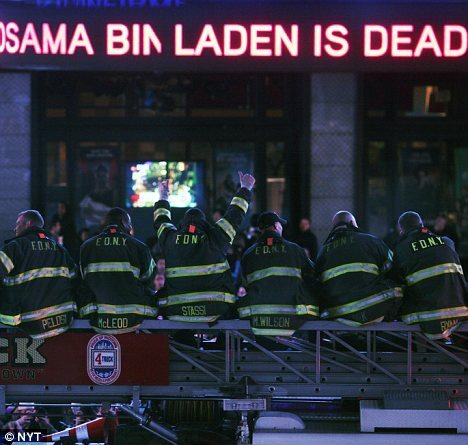 McLeod, second left, was pictured in Times Square after President Obama's announcement that Bin Laden was dead. The decision of the Secret Service to keep McLeod away that day has angered the Vulcan Society, an organization of black firefighters. “[The] Secret Service only wanted the people that were working that tour there, and it is unfortunate that some provisions could not be made for the only black firefighter in the firehouse to be there also,” said Michael Marshall, the organization’s first vice president. Ahead of Obama’s visit, the Secret Service asked for a list of people the president would meet and their social security numbers to check their backgrounds. Some 17 firemen were vetted. Of the 50 people at the firehouse, McLeod is the only black fireman. The poor representation of minorities in the New York Fire Department has already led to a successful lawsuit to force it to change. 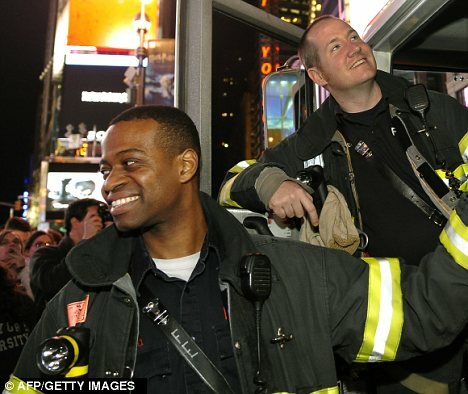 Black firefighters make up just 340 of the 11,000 firefighters in the department. A spokesman for the New York Fire Department said that more than 30 other firefighters were banned from attending Thursday’s event. The only two exceptions were two chefs who were brought in to cook for the president. based on the information in this article, i dont see any harm or foul. it is unfortunate that he was not on the guest list but i dont think it was because he was black. it seems more like he felt entitled to attend because he was black. im just saying. DANG!! the least they could of done was let Mr McLeod meet Pres Obama what was the harm in that???? There would of been no harm in letting Mr. McLeod meet our President…just because he wasn’t on duty that horrible day is an excuse.